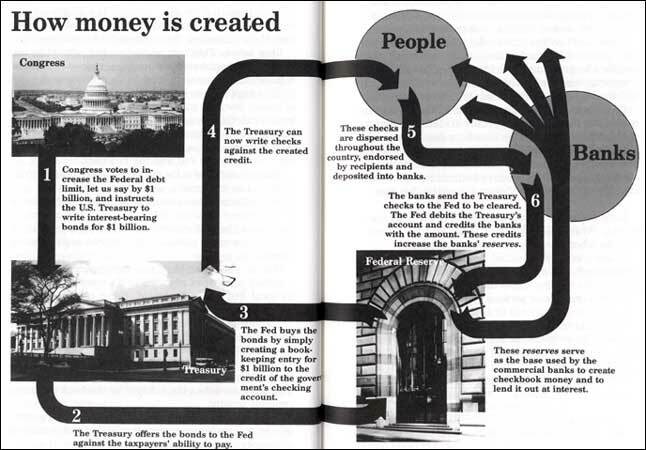 The crisis has altered this old picture of the money creation process. The partnership between the government & the Federal Reserve Banks has been creating money to replenish their partnership. Relatively little of recent money creation has been getting to the people (click to enlarge). Dr. Ron Paul is among the top of our Most Admired Advisers (MAA) for good reason. His recent essay, published in the Wall Street Journal, is a case in point (link to his essay is below). Dr. Paul emphasizes that to understand the economy's problems, you must "first understand the nature of money". His message and ours are almost identical. Our stated "GOALS" say: "DEFINE MONEY. Understand how it is issued, controlled & its designing structure before trying to understand economics & markets." Also: "the heart to economics is: How have you defined your Money? It is lifeblood to the economy." Dr.Paul's essay says: "the Federal Reserve fails to grasp that an interest rate is a price - the price of time ... its attempt to manipulate that price is as destructive as any other government price control ... Money is not a government phenomenon, and it need not and should not be managed by government. When central banks like the 'Fed' manage money, they are engaging in price fixing, which leads not to prosperity but to disaster." Dr. Paul claims: "The Federal Reserve has caused every single boom and bust that has occurred in this country since the bank's creation in 1913. It pumps new money into the financial system to lower interest rates and spur the economy ... increases in the supply of money make the price of money (interest rates) ... lower than the market would make it. The lower interest rates affect the allocation of resources." Resources get mis-allocated. Money gets invested where a free market would not go. Projects and ventures that only seem profitable at artificially low interest rates are not the best use of the nation's resources. The constant balancing (and rebalancing) of economic activity, a primary function of free markets, is lost. Cliff Küle's Küdos to Ron Paul for saying it better than we could ourselves. Our money is owned & controlled for the benefit of those who own & control it. How often have we tried to explain that the Federal Reserve is essentially a 'Politburo'? He who controls the monetary system controls the economy. Our system works better than a Communist economic system because some of our system is 'Free Market Capitalism'. No matter how many times people repeat that we live in a pure system of 'Free Market Capitalism', it does not make it true. The truth is that America's money is owned by the Federal Reserve and the Federal Reserve is not owned by the citizens or the government. If money were a physical object, 'ownership' would be so much simpler to understand. However, money is an abstract concept & understanding 'ownership' of something abstract is not easy. To make it simple we suggest that Americans understand this: We, the people, are not allowed to audit the Federal Reserve, or find out who actually owns it. These things would be no problem if Government &/or the People owned America's money. Too Bad - So Sad for the 99% - who are not closely connected to the owner /operators of our country's money. Money is the 'blood supply' to the economy. A Central Bank with the power to create money out of thin air is like a doctor that has attached & controls an intravenous pump. Dr. Bernanke & his team of doctors decide how much 'blood' to pump & which organs will receive it. The money is under the control of those doctors at the Federal Reserve. How free are people whose blood supply is under someone else's control?